Today's rant will be on the topic of parking. For most people, it is something that you either learn to do in Driver's Education, or the proper technique is so blindingly obvious that you never even think of it as a skill. I have complained before about bad drivers. But bad parkers annoy in a way that bad drivers do not. The bad driver makes you curse momentarily as he or she turns abruptly without signalling, or wanders down the road at a snail's pace while applying makeup or reading the newspaper. But soon enough they are just a memory. 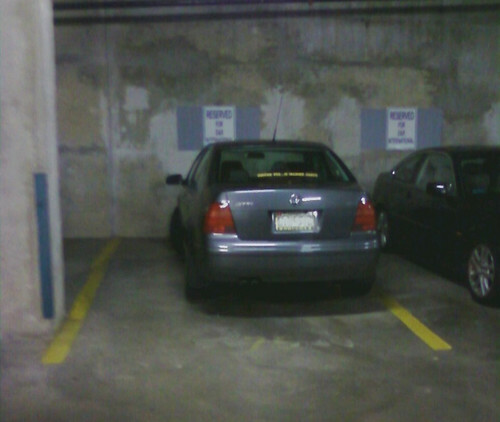 The bad parker, on the other hand, frustrates completely. They prevent YOU from being able to park, and there's nothing you can do about it. There is little satisfaction in flicking off an empty car. Today we showcase two of the most irritating kinds of bad parkers. These are not the complete jerks who intentionally take up two parking spaces so that nobody can park near their car. No, those people are a different class of devil. They are fully aware of their actions, they are purposeful. Those people deserve to have their cars keyed. I am talking about the other kind of bad parkers: the ignorant ones. These are the people who simply don't get it. They think so little about the way they park, that you wonder how they can figure out how to open a can of soda. Bad parker #1: The Edge Parker. The parker featured here leaves his car technically in the parking spot, but is so close to the edge of the space that anyone parking next to them will require skills comparable to that of a space shuttle pilot while docking with MIR. The situation pictured here is an especially egregious violation. You can see to the left of the car is a pole in the parking garage. 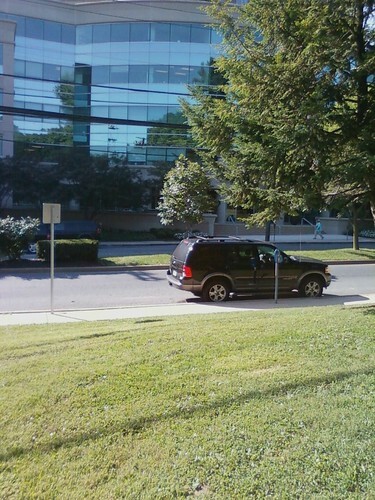 There is a large open space on that side, meaning that one could actually park close to the other side and still be guaranteed plenty of room to open the car door. As an additional benefit to parking that way, no other car can park close enough that you risk door dinging. But no. Instead, this person chose to squeeze all the way to the other side, ensuring that anyone needing the spot next to them would have to be driving a Mini Cooper, or alternatively be trained in operating a bomb-defusing robot, in order to park in the space and still have enough room to get out of their car. This kind of pest has either just moved to the area from Nome, Alaska, where there are no parking meters, or, more likely, is a complete idiot. 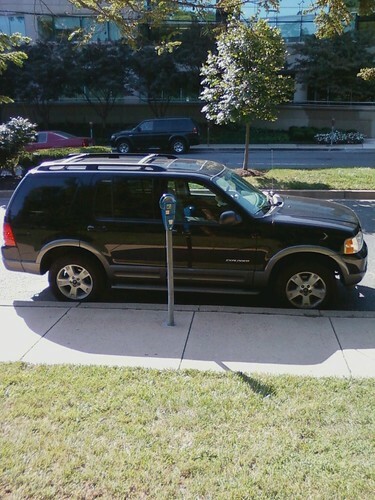 They have parked their car directly in front of the meter, effectively consuming two parking spots. The violation that I've captured here is the worst kind: they are in the end spot. Even if you were born yesterday and have never parked at a meter before, in the wide shot you can see the "No Parking" sign that designates the end of the row of parking. Yet instead of parking as close as possible to the sign, they left a space into which only a Smart Car could fit between themselves and the end of the legal parking. This street does not have lines delineating the parking spots. 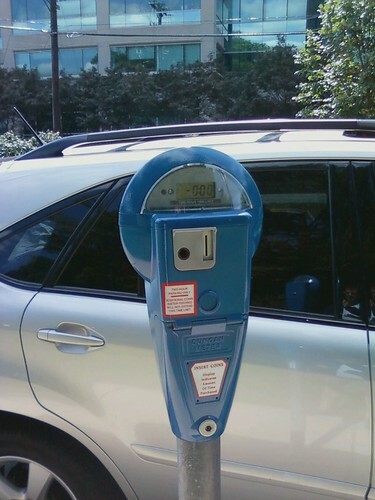 But most do, and there is not a single place on earth that positions the meter in the middle of a parking spot. So just because there aren't lines painted on the ground, and an instructional video available on the parking meter to explain how not to be a moron, you think this meter works any differently? Everywhere in the entire civilized world, you park between meters and pay the one at the front of your car. The only exception is those places with the "double meters," but in that case it's even more obvious which one is for you. Apparently, though, if that isn't spelled out to some people, every single place they park, it's a baffling ordeal to figure out where to leave your car. In some ways, I blame Montgomery County. They could paint the lines to help the mentally deficient. They could also ticket these fools relentlessly for not paying both meters - but they don't. I've watched the meter people callously ticket cars parked correctly, whose meters have just expired, but for some reason let these guys take up two spots without ticketing them. But much more than Montgomery County, I blame the idiots. For the record, the garage car had Maryland plates, and the meter car had Virginia plates. Just sayin'. Both of these pictures were taken today at my office building. This is not a rare problem. It is a pestilence. 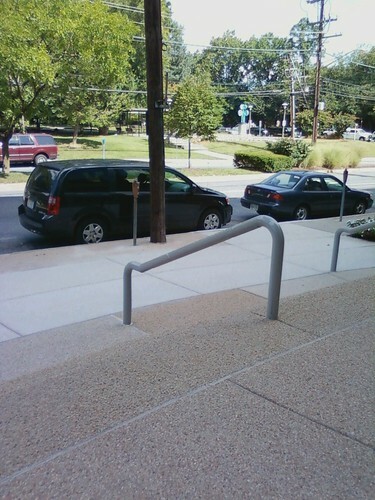 Update, 11:00 AM: Apparently, Silver Spring is a magnet for the parking impaired. Or perhaps it's just human nature to see something stupid, and follow suit. Basically every car on the street is parked idiotically right now. I love the last one, who I actually watched park between two spots and not even pay for the meter. Two more meter morons, a third visible across the street. Fourth meter moron. This one decided to take two spots for the price of zero. The percentage of people who park badly in São Paulo appears to be similar to the percentage in the US, but I don't get how people manage to park so badly in the US, where the parking spaces are so enormous, even compared to the probably-compensating-for-other-deficiencies enormo-wagons (SUVs and 4WD pickups with leather seats that have never been within 20 miles of a dirt road, monster luxury cars, etc.) so many people have. At least drivers here have the excuse that parking spots are ridiculously tight, even for the smaller (on average) cars we have here. To give you an idea, a Honda Civic is a pretty big car here. I'm not kidding. PETA: Hoax, or You Can't Make This Stuff Up? An apology, and an update.